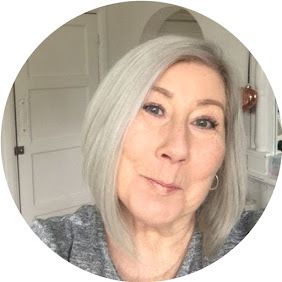 This fabulous British company is still relatively new and was founded by 57 year old Jayne Mayled after deciding to fully embrace her glorious grey she needed the right products to perfect it, so started the company herself....well why not ?
" Age and experience is a beautiful thing"
Although 58 I have not yet had the pleasure of going fully grey, which is really quite annoying as I would love to have pure white glorious natural white hair, to this end my locks are bleached to within an inch of their life and as such suffer the same problems as grey hair, dullness, dryness and yellowing, I am constantly in search of products to stop my head resembling that of a scarecrow doing it's job in a field ! In comes White Hot. I am going to give you the low down on the 4 products I have tried so far from this range on a product by product basis, as I think they all deserve a little review in their own right. Lets start as you would washing your hair with the Shampoo. I have tried Glorious Shampoo and Brilliant Shampoo. Brilliant Shampoo, I would use this once or twice a week to remove any signs of yellow, and to increase brightness, it is a very pale violet colour with the most divine fragrance reminiscent of a very expensive salon treatment. There was a noticeable improvement to the colour of my hair from the very first use, I would definitely use this before going out, just to ensure the colour was at its best. Glorious shampoo, ohhhhhh my goodness, this is like liquid pearl, it comes out of the bottle all pretty and pearly, giving it a very luxurious feel and look to it. It has a detoxing complex to neutralise shine-dulling pollutants and an added touch of white truffle known for its moisturising properties. You only need a small amount of these shampoos so a little goes a very long way, unlike cheapie brands where you need a handful to get a good lather. Luminous conditioner, this really is something else ! it's thick creamy consistency really did spread a long way, my hair drinks conditioner, and this left it feeling like silk when it was wet, I didn't even need to comb through after using, literally running fingers through was enough ! And to finish off Lifeshine Oil, If you have never used a finishing oil before you really are missing out, this little gem only needed a tiny 1 pump on damp hair to give my hair the best smell and shine it has ever had in it's life, and unlike Moroccan oil it was light in texture with no greasy feel to it.
" Oh Lyn you need this shampoo and conditioner " ok says Ms Gullible and came out £48 quid lighter in the purse and too embarrassed to say anything ! 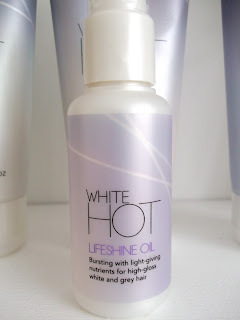 White Hot certainly is value for money, and as I said before a little goes a very long way, my hair has never been as soft or glossy, anyone with grey or blonde hair knows this is a miracle in itself, as it is notoriously difficult to get a shine. I love the fact that it is a British Company the products are made in England and not tested on Animals. The company has a small team who are more than happy to give advise directly over the phone or by email. Hope you try them and love them as much as I do, watch out for further blogs on their other products, cant wait ! This review may contain press samples, comments are entirely my own and I do not review products I wouldn't personally use.